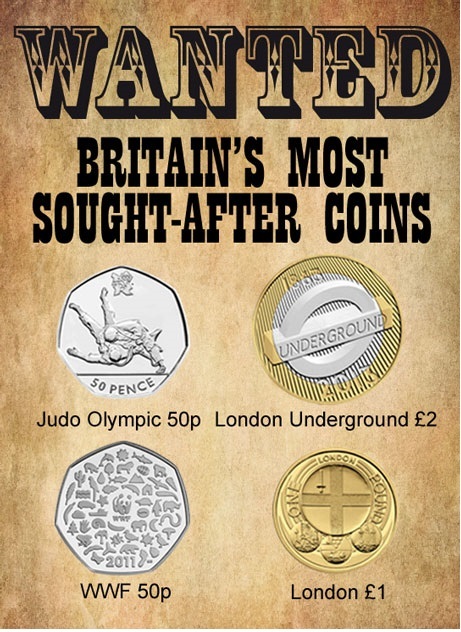 Wanted – Britain’s most sought-after coins. Using our Change Checker stats we have recently embarked on some number crunching to gain an accurate idea of collecting patterns – here we reveal which coins are the most requested by users. The results may surprise you..
Of the 29 Olympic 50ps which are still proving immensely popular with collectors, the most sought-after coin is Judo, closely followed by the highly publicised football 50p which explains the offside rule through a simple diagram. The triathlon design takes the bronze medal in third place. The London Underground £2 series was released at the start of the year to celebrate the 150th anniversary of the tube, and it is the iconic Roundel logo design which tops the table of most requested in the £2 category. Not far behind is the innovative Charles Dickens £2 which was issued last year and features the author’s famous profile crafted from the titles of his most famous works. The London 2012 Handover to Rio £2 marking last year’s Olympic handover ceremony makes up the top three in the category. One coin which has seemed to unite favourable public opinion is the WWF 50p issued in 2011. The design by Matthew Dent features 50 individual icons which represent the various facets of the WWF with the famous Panda at the heart of it. The design tops the most requested by Change Checkers in the 50p category, closely followed by the Girl Guides. The UK’s entry to EEC was the first commemorative design of the newly sized 50ps, and this is currently the third most requested. £1 coins often go unnoticed as commemorative issues, but there are four different series of £1 designs which have been in circulation for nearly 30 years. They all carry the same concept of representing each of the four constituent countries in the UK through various themes. There was an obvious trend in the Change Checker results with the Capital Cities series making up the entire top 3 with London the most requested, followed by Belfast and Cardiff. Have you got any of these coins available to swap? Maybe even all four in our wanted poster? If so you’ll be a very popular person in the Change Checker Swap Centre.